"The danger of audible prayer, is that we fall into temptation through it, and become an involuntary hypocrite. First, by uttering what is not a real desire, and secondly, consoling ourself under sin with the recollection we have prayed over it. 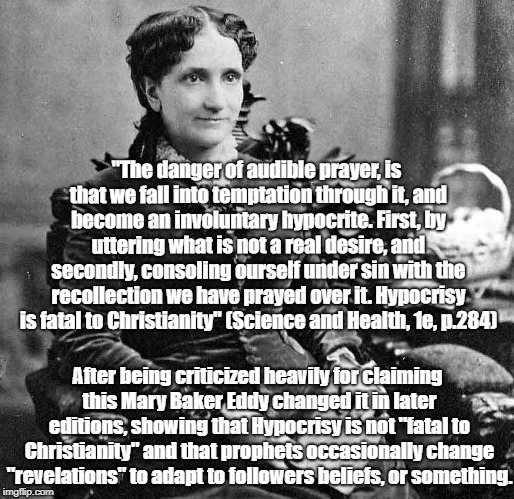 Hypocrisy is fatal to Christianity" (Science and Health, 1e, p.284); After being criticized heavily for claiming this Mary Baker Eddy changed it in later editions, showing that Hypocrisy is not "fatal to Christianity" and that prophets occasionally change "revelations" to adapt to followers beliefs, or something.